Passionate vegan and animal advocate Lucy Watson talks about veganism, activism and shares her ultimate comfort food recipe! Who or what inspired you to become vegan, and how did/does this influence you? I was vegetarian, before becoming vegan, for ethical reasons having been exposed to the cruelty in the animal agriculture industry from a young age. I didn’t learn how cruel the egg & dairy industries were until I watched Cowspiracy and then I made the change the next day. What was the largest hurdle for you to overcome when you first became vegan? Cheese! I didn’t know how I was going to live without it. Now I look back I realise it was an addiction and an unhealthy one at that. There are so many amazing replacements now and you don’t actually need cheese in your life to be happy and fulfilled. What is your advice for anyone who might be struggling with their vegan journey? Keep educating yourself on the cause – watch documentaries, there are so many different ones out there focusing on different reasons why you should go vegan. Food is a big motivator for me, I enjoy trying/cooking new recipes, especially when you come across something you really love! This could also help encourage any meat eating friends. How do you think attitudes towards veganism have changed over the past 5 years? It’s gone mainstream and actually become “cool”. This is due to many celebrities with large platforms being open about their vegan diet choices. It has also gone the other way with some die hard meat eaters in the sense they seem to be slightly more threatened by the movement therefore even MORE against it than ever, which is a shame. What does veganism mean to you in the modern world? Living a cruelty free lifestyle as best as I know how, whilst also accepting that it is impossible to be 100% cruelty free in the world we live in. What do you like to cook when you want to showcase how delicious a vegan diet can be? Normally Italian cuisine, pasta dishes seem to be the way to most people’s hearts! What motivates you to continue your activism? The knowledge I have about the industries I no longer support & never will. I’m motivated just knowing that I’m not paying for animals to be brutally murdered. What does 2019 have in store for the Feed Me Vegan range and TYF? We are bringing out new meals this year which I’m so excited about! TYF will always be introducing new meals to the menu and I’m excited about some of the events we have coming up this year. What excites you about being a part of the Veganuary campaign this year? I just think Veganuary has grown so much in the last 5 years – I’m very happy to support this as they are doing big things for the movement. A lot of people go vegan for a month and realise how easy it can be and how great they feel and don’t look back. If someone wanted to become vegan, but is concerned about missing out on the food that they enjoy, what would you recommend? You can literally have everything you want and more, but vegan versions – I catered my first book to people that worry about this. Tell us your ultimate vegan comfort food recipe! There are so many! My ultimate has to be the vegetable & vegan chorizo stew with mustard dumplings from my second book – soooo good! Grab your copy of Lucy’s award-winning vegan cookbook ‘Feed Me Vegan’ here! The perfect winter comfort food, this dish is super filling so don’t overdo it! I love to have it with a side of veggies. Preheat the oven to 180°C (160°C fan, gas 4). Using a sharp knife, score a cross-hatch over the flesh side of each squash half. Put on a baking tray and rub the flesh with the crushed garlic, then scatter over the thyme and season generously with salt and pepper. Drizzle with the oil.Bake for 45–50 minutes until the squash is completely tender and tinged brown. Scoop the flesh from the squash, discarding the skin. Put the butternut flesh in a pan over a medium heat and break it down with a wooden spoon. Continue cooking for 30 minutes, stirring regularly to remove as much moisture as possible. Leave to go completely cold. Stir both flours into the squash purée and season with a little more salt and pepper. Flour the work surface and roll the dough out into 3 long sausages, about 2cm wide, then cut into roughly 3cm lengths. Cook the gnocchi in a pan of boiling salted water for 3 minutes or until they rise to the surface. Drain in a colander and leave and allow to steam-dry for a couple of minutes. Add about 2 tbsp olive oil to a frying pan over a medium heat. 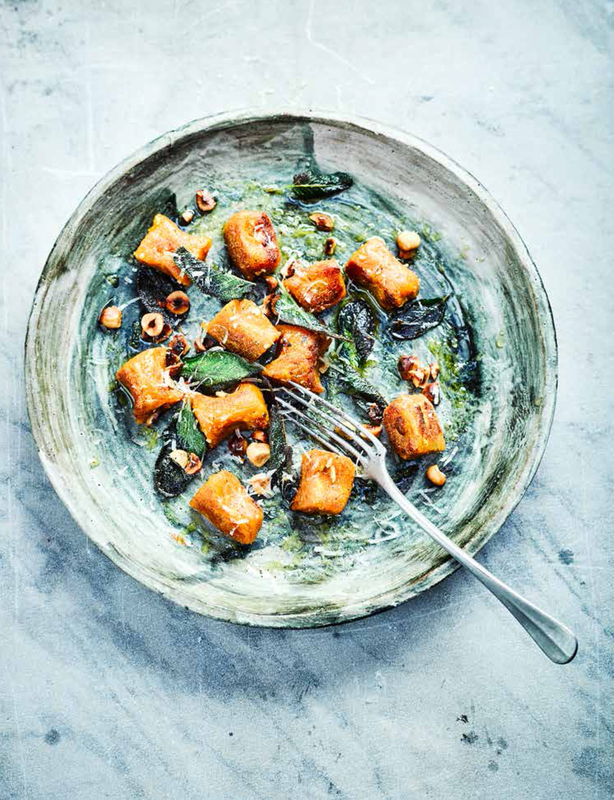 When the oil is hot, add the gnocchi, hazelnuts and sage, and pan-fry until they are tinged brown on both sides and the sage is crispy. Spoon into bowls and grate over a little cheese to serve.